Observed on the lower surface of a Guava leaf at Eldoret Kenya. Oct. 2016. The large insects are ants belonging to the genus Myrmicaria. Many of the insect pests that make farming difficult are very, very small requiring a good magnifying glass or microscope to see what is going on and to make accurate identifications. The largest aphids in the photos here are about 2mm in length. In the photo above notice one aphid with wings. This is a founding female - she flew to this host plant and began laying eggs. In the photo at left several small white eggs can be seen. Also in the photo above is an adult wingless female. She is ready to begin reproducing and will do so by bearing live young and will do so without mating - she reproduces parthogenetically. Growth from egg to reproducing adult happens quickly, probably about a week! In the photo above a young, immature aphid is at lower left. As aphids grow they must shed their exoskeletons several times before reaching adult. Some of these empty skins can be seen in the photo at left. 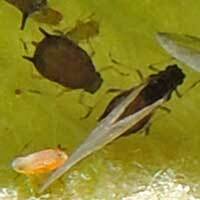 A few founding aphids can result in huge colonies of rapidly reproducing bugs in very short order. But aphids have many enemies - predacious and parasitic insects that can destroy them as quickly as they can reproduce. That is where the ants come in! The aphids give the ants honey dew with sugar and exchange the ants protect the aphids. 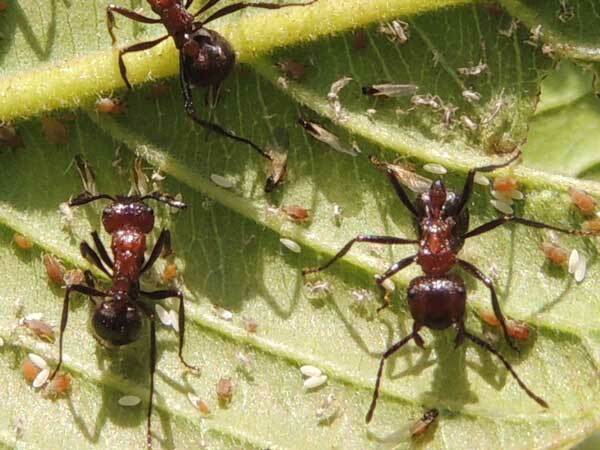 Together the ants and aphids can cause damage to crop plants.